Over the years, we have talked to thousands of agents all over North America and we always get asked the same question. "What is the best way to get seller leads?" The most successful real estate professionals using Facebook to grow their business create more content than just seller ads. This does not mean you shouldn't run seller ads, but it should not be your entire marketing strategy. Over the last 5 years, I have created thousands of Facebook ads and helped our clients spend millions of dollars to get them in front of the world. Here are some of the most successful targeting strategies I've learned and developed to help get the attention of potential sellers. Although Facebook rolled back many of their targeting options in 2018, they still give their users the most targeting options of any advertising platform out there. We recommend that you ignore most of them. If you try to make your ideal client profile on Facebook using all the demographic, behavior, and interest-based filters, you'll probably end up with an audience too small to be effective and miss out on many potential leads. Target based on AGE and LOCATION and let Facebook Algorithm do the work for us. 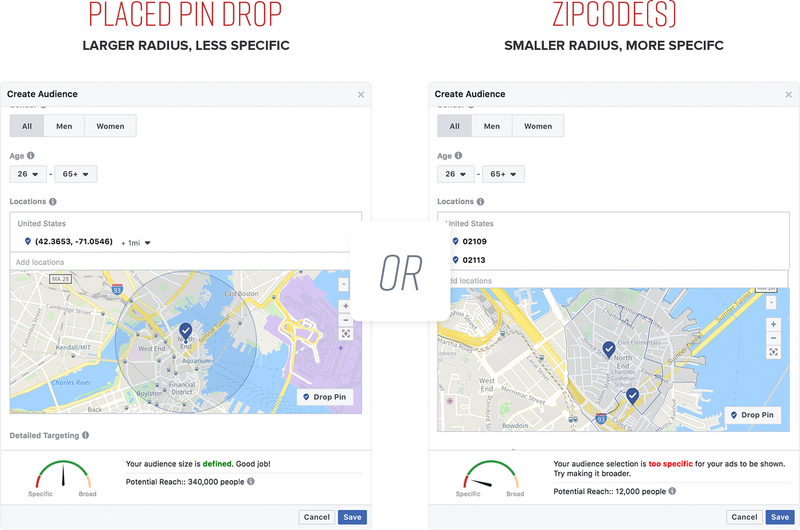 This algorithm knows more about its users' browsing activity and once an ad starts to get clicks, Facebook will automatically find similar users and place it in their feeds, too. The best way to qualify your leads is through your ad copy, not ad targeting. What does that mean? You'll qualify more leads through better copywriting than you will by targeting based on political affiliation and favorite TV shows. We immediately know something about someone if they click on that ad. We know they are "thinking of selling in 2019", the top copy is too broad and does not tell us much about the consumer (other than they want to know the value of a home). Age: A good starting point is 26-65+, unless your market has very specific data that can prove otherwise. It's better to go broad and let Facebook's algorithm do the work for us. I generally recommend when in doubt go a bit wider. Zip Code or Point on the map? use whichever works better for your market. You're probably familiar with retargeting. If you've ever noticed an Amazon ad that's promoting an item to you that you recently looked at, you've been retargeted to. Because you're reading this blog post, you'll probably see an ad for Curaytor in the next few days. It's why every website you go to on the web has a message about "cookies" - your browsing history is being tracked, for the purpose of giving companies a chance to advertise more targeted messages to you based on your current interests and needs. As a browser, this alternates between creepy and convenient. As an advertiser, it's an opportunity to engage in a longer conversation with a potential client. Just don't be creepy about it. Depending on the content on your website, you can go either broad or narrow for this. The important thing when retargeting someone who has been to your website before is to take them farther along the journey. If you have a buyer-themed website with IDX search, a retargeting ad showcasing homes similar to your visitor's last search is a valuable continuation of their experience. Similarly, a seller-centric website with blog posts, pages, and guides is full of content worth sharing with recent visitors, adjusting for what pages they've visited. You will be able to customize the copy and image based on what pages they have visited and brought them down a marketing funnel. Facebook also allows you to retarget people based on their engagement with your Facebook and Instagram pages, post, ads, and videos. Depending on the kinds of content you put on Facebook, this can be really effective. If you are consistently adding value through high-quality Facebook posts (not just the same 5 spring cleaning tips that many agents publish every year) this can be a great way to re-engage with people who have expressed interest in your brand. Pro-Tip: Facebook allows you to retarget people who have watched specific videos. If you have seller-centric video content on Facebook, boost it and retarget to people who have watched >10 seconds with other seller ads to drive them down the funnel. Admittedly this is a little more of an advanced targeting option because in order to use Custom Audiences, Facebook now requires you to set up your ad account under Business Manager. But who better to run ads to than people who have already opted into your database? Running ads specifically to people who opted in* to your marketing is going to get some of the best ROI of any marketing efforts. *This language is important: these must be contacts who have opted in. You can not purchase a list of emails and load them up. This is against Facebook's Terms of Service and, beyond that, is a tool for shady marketers. Many novice marketers fail by trying to marry their leads before ever dating them. What I mean by that is before the consumer knows anything about them or their brand, these marketers are asking for a full name, phone number, email, address, and trying to sell their home. While it isn't impossible to collect that info, there's definitely a better way. You'll see much better results if you drive traffic to your website using content on your blog to get their attention and build trust. After they have seen and engaged with your marketing on Facebook, your website, and their inbox a few times, then it's time for some fastball marketing. Pro-Tip: Just don't run ads for home values, stand out with Stories. Facebook is the great equalizer when it comes to digital marketing, Facebook does not care if you are a real estate agent, car dealership, yoga studio or restaurant, they will deliver the best ads available to the Facebook user at that time to give them the best experience possible (and people will only click on them if they are good). Ad copy or images that work well in one market may not do as well 3 towns over. If your area has a lot of high-quality marketing on Facebook, that just means you will have to raise the bar. The idea that “Facebook ads don’t work” is simply not true -- it just takes consistency. It’s the beginning of a new year and the habits you form, the direction you set, and the decisions you make will all have a huge impact on your business.